What’s the most reviled weed in the lawn world? Taraxacum officinale, otherwise known as the dandelion. 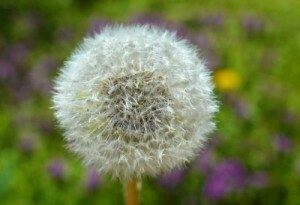 Its flower can mature from bud to seed in as little as 24 hours, and once the puff balls appear, the seeds can easily spread on the slightest breeze. Dandelion seeds thrive and germinate in warmer temperatures – over 50 degrees – and moist soil. If temps are cooler or the soil is dryer, these resilient pests can go dormant and sprout decades later, when conditions are more to their liking. This is one hearty weed! Try these tips to keep your lawn lush and free of these most dreaded of lawn weeds. Pulling dandelions is one surefire way to get rid of them. Just make sure to get the entire taproot, or the weed will reemerge and once again decorate your lawn. The taproots can be long, so take care when extracting the plant. While screwdrivers and trowels will suit the purpose, specialized “stand-up weeders” or “dandelion weeders” are gaining in popularity. These spike-like devices allow you to stand as you remove the weed, saving your back from the strain of repeatedly bending down to pluck the pest from the ground. Their simple action can make quick work of pulling lots of weeds. Understand that digging out dandelions is a repeat activity. Because the taproots are so long, it’s unlikely that you’ll nab all of them on the first try, so plan on digging out the weeds on a weekly basis. For a chemical solution to ridding your lawn of dandelions there are two types of herbicides to use: broadleaf and non-selective. Which one you use depends upon where your dandelions appear. For dandelions that are not surrounded by grass, such as those on sidewalks, use a non-selective type. That’s because non-selective herbicides kill everything they come into contact with. More commonly, dandelions will appear in lawns. In that instance, use a broadleaf herbicide, as those attack only broadleaf weeds, and not grass. Some are packaged in a bottle that you attach to your garden hose, and spray on the weeds. Others are powder or a liquid that require mixing and applying by hand. In either case, be sure to follow the manufacturer’s directions. It’s important not to mow the grass for a few days before and after applying the herbicide. And avoid rain if you can; don’t apply the solution in wet conditions. Here’s a valid reason to leave your clippings on your lawn. 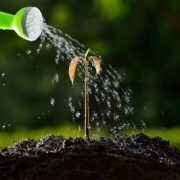 The decomposing clippings prevent seeds from landing on the soil and taking root. Treat dandelions anytime they appear, of course. To prevent dandelions, fall is the ideal time to treat your lawn with a broadleaf herbicide. It’s best to kill the weeds in the fall so they don’t live through the winter and re-sprout in the spring.